Today the 1st July 2016 marks the 100th anniversary of the start of the bloodiest battle in British army history. The Battle of the Somme lasted 141 days, from 1st July to 18th November 1916 and stretched along a 15-mile front of northern France. 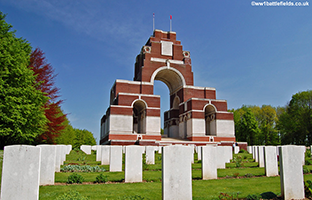 The official number of British and Commonwealth dead, missing or wounded during that period is 419, 654, with 72,000 who have no known graves and whose names are recorded on the British memorial at Thiepval. Counting the French and the German soldiers more than 1 million men died in those 141 days. An 8 day artillery bombardment failed to destroy the German defences with most of the barbed wire left untouched and the German machine gunners safe in deep concrete lined bunkers, the men in the trenches after the signal of a whistle, went "over the top" only to be mown down by German machine gunners, on the first day, 60,000 British and Commonwealth troops were killed, missing or wounded, the greatest losses by the British army in one day. The war had become a "war of attrition", now victory would be measured by who could kill the most men using the latest weapon technology. The Scots were heavily involved in the Somme with at least 3 full Scottish Division at the battle (between 36,000 - 50,000 troops) and it is often stated that Scots suffered disproportionate losses at the Somme. McCrae's battalion of Royal Scots had a 75% casualty rate and the men from the Glasgow pals battalions of the Highland Light Infantry lost 3,500 men in one day. 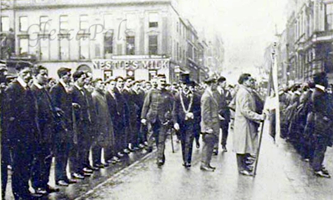 Pals battallions were made up of men who enlisted together in local recruitng drives, with the promise that they would be able to serve alongside their friends, relatives, neigbours and workmates, men such as brothers Alexander and Joseph Coffell (honoured below) both born in Govan who enlisted on the same day and both died on the first day of the Somme, the high losses at Somme had meant the end of pals battalions and shown that they had been a mistake, this was due to the fact, that in one battle a village could lose almost all it's men or a family all its sons. Many men from Govan who were born in Ireland or had Irish parents had enlisted with Irish regiments who lost 3,500 men at the battle of the Somme. The Govan Reminiscence Group would like to honour some of the Govan men below, most from the Glasgow Pals and Irish battalions who lost their lives on the Somme on the 1st July 1916, a day regarded as the bloodiest in British military history. Private ALEXANDER COFFELL (No. 26183) aged 22, son of Alexander and Elizabeth Coffell, of 47 Harmony Row, Govan, buried at Lonsdale Cemetery, Authuille, France. Rememberd with Honour. Private JOSEPH COFFELL (No. 26184) aged 32, son of Alexander and Elizabeth Coffell, of 47 Harmony Row, Govan. Remembered with honour on Thiepval Memorial, France. Private NEIL McDONALD (No. 14567) aged 24, son of Malcom and Mary B. McDonald, of 14 Elderpark Street, Govan. Remembered with honour on Thiepval Memorial, France. Private ALEXANDER STORRAR (No. 3421) aged 22, son of John Morton Storrar, of 16 Gilmour Street, Ibrox , and the late Jane Ann Donaldson Storrar. Remembered with honour on Thiepval Memorial, France. Private JOHN M. ROSS (No. 16095), aged 27, son of Barbara Ross, of 9 Merrick Gardens, Ibrox, and the late John Ross. Remembered with honour on Thiepval Memorial, France. Private ROBERT R. LETSON (No.20372), aged 27, son of Mr. R.J. Letson, of 16 Fairfield Street, Govan. Remembered with honour on Thiepval Memorial, France. Private WILLIAM GRAY (No. 19536), aged 24, brother of Mrs Rawson of 2 Ingram Street, Govan. Buried at Bray Vale British Military Cemetery, France. Remembered with Honour. Private THOMAS H. HOLMES (No. 14250), aged 27, son of David and Martha Holmes, of Portadown Co. Armagh; husband of Jane Hanna Holmes, of 4 Marr Street, Govan. Remembered with honour on Thiepval Memorial, France. Private ALEXANDER MacDOUGALL (No. 900), aged 23, son of John and Marion MacDougall, of 105 Elderpark Street, Govan. Born at Islay, Argyll. Buried at Ancre British Cemetery, Beaumont-Hameli, France. Remembered with Honour.